Hawaii is the only U.S. state located in Oceania in the Pacific Ocean nearly 2100 miles southwest of the United States' mainland. Hawaii is 2,390 miles from California; 3,850 miles from Japan. It is home to 1360301 people, and its capital is Honolulu. Hawaii is the 8th-smallest and the 11th-least populous and the 13th-most densely populated State of the US. 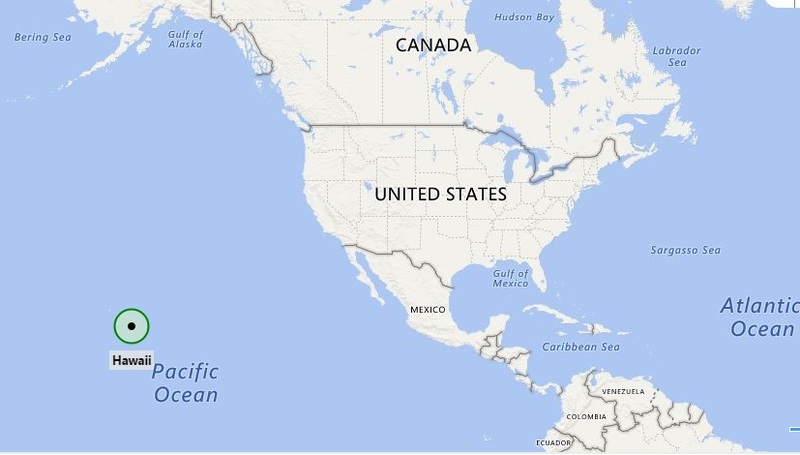 Map showing Hawaii Location in the US. Hawaii in English Hawaiian is the most recent state of the 50 US states. It is admitted as US state in the year 1959. The uniqueness of the state you can easily identify on the given map of Hawaii state US i.e. Hawaii is the only state that entirely located in the Pacific Ocean or in other words, it is only island state of the US. Eight main islands—Hawaii, Kahoolawe, Maui, Lanai, Molokai, Oahu, Kauai, and Niihau. The Hawaii state US has many features of tourists’ interests including warm tropical climate, active volcanoes, vivid native culture, and other natural beauty. So the place is not the place of interest for the tourists but also researchers, students, and scientists. As you can see on the given Hawaiian state map US that the state comprises of almost the entire volcanic Hawaiian Island chain, which consists of hundreds of islands spread over 1,500 miles. On he given Hawaii map, you can identify some of the major Hawaiian Islands including Niihau, Kauai, Oahu, Molokai, Lānai, Kahoolawe, Maui, and Hawaii. However, the last one i.e. Hawaii is by far the largest and more often known as "The Big Island" with the purpose to avoid confusion with the state as a whole. Honolulu is the capital and largest city of the U.S. state of Hawaii. Honolulu is the nation's 11th largest metropolitan area. It has a total area of 68.4 square miles. 18% Agnostic, 9% Buddhist, 5% LDS, and 5% other.